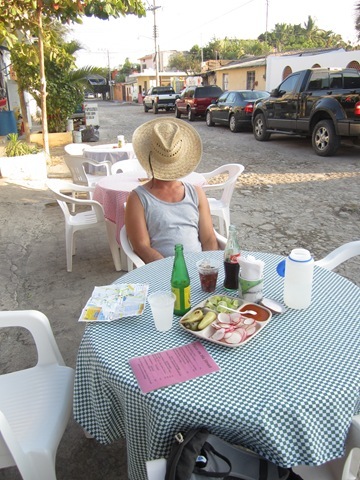 I haven’t been very shy about my love of Huanacaxtle Bar and Cafe in La Cruz. It will always hold a special place in my heart. It was one of the first places we tried out when we arrived in La Cruz and it quickly became the only place we frequented regularly. It’s not just the convenient location near the marina or the cheap, tasty food, or even the ridiculously cheap and tasty Chope draft beer during happy hour (although, that is a big reason), it’s because of the people that work there. So welcoming. So helpful. Our first days here I would walk up to Huanacaxtle just to have them confirm that I was heading in the right direction on the bus and that I had the correct bus stop info. 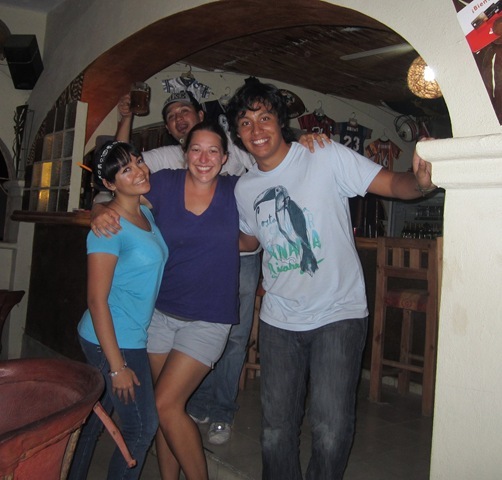 J.C., Alex, Oliver, Abril, and the owner, Manuel, became a little family to me while staying here. 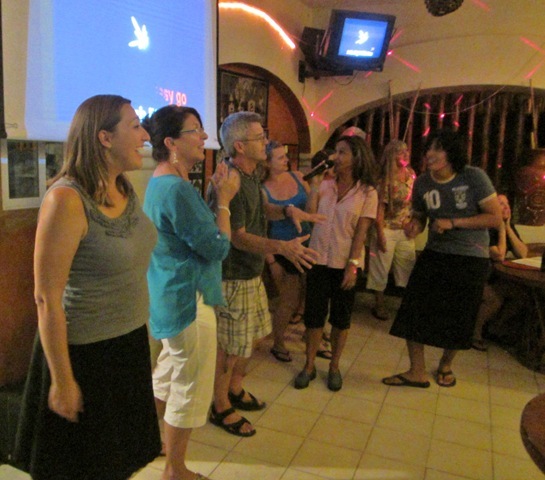 I had hoped to attend my final Karaoke night the Thursday before my departure home for a farewell to La Cruz and my new friends. Unfortunately, we had to go back to Paradise Village on Thursday morning and so we’d be too far for me to attend the weekly fun fest. I was very sad and booed at Dave numerous times. We went into town last Tuesday, April 25th (which, by the way, was my Dad’s birthday, so I’m attributing the drunkenness to a celebration of my dad’s bday. I’m sticking to this story…) for the last time. First stop – Huanacaxtle Bar and Cafe, of course! Happy hour Chopes are the best way to end a day. As we’ve sadly realized lately, we were the only cruisers in there. There just aren’t very many people around anymore. But the owner’s family was there enjoying dinner. I told Alex and Oliver, our usual waitress and waiter, that it would be my last night in town and I was sad that I was going to miss the Karaoke on Thursday. Oliver told me to come back later tonight and join his family singing Karaoke. He said it was just going to be them but that we’d be very welcome to join. Oliver and his cousin bustin out a song. So we went and ate at our usual taco stand for the last time (Tacos de Lena) and then walked back over to Huanacaxtle for a final chope and a song. Of course it turned into seven chopes (between the two of us…we weren’t that crazy) and quite a few songs. Oliver even got me up to sing a Spanish song. It had a pretty simple tune and gringo-friendly wording, so Oliver just whispered it into my ear and I sang. It probably wasn’t very good, but everyone made us feel like family and (at least pretended to) loved every minute. Goodbye Wanna-cocktail…I mean, Huanacaxtle. Love you guys! Coming back to La Cruz after cruising south for a couple of weeks was a unique experience. 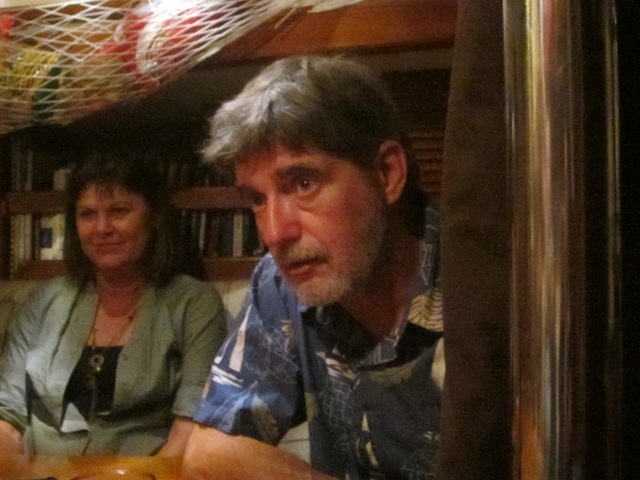 It was the first time we’d returned to a port or anchorage that we had already visited. In a way, it was nice to not have to question where and how to go ashore, where to anchor, where to eat, where to get supplies, etc. We knew it all! While La Cruz was mostly unchanged, it was now the latter part of the cruising season and some things had changed to adapt to the lack of people. First of all, the anchorage was bare in comparison to the amount of boats that were there when we left just two weeks prior. Mostly single-handers at this point, so Dave will fit right in when I return to the States. It’s been a little sad sitting at anchor with no Charisma, Convivia, Dos Leos or Navigo sitting next to us. Now I have to play with Dave (LOL…just kidding Capt!). The morning net solely consists of the weather, tide information and maybe one or two announcements. One morning we woke up at 8:45a, just missing the start of the 8:30am net. It was already over. It used to be that the first 10 minutes were boats checking in! Also, we learned the hard way that happy hours at our favorite drinking holes have moved from the late afternoon to the evening. Boo. What happens now when I want a Cesar at 4pm?? The Tuesday and Friday produce market? Moved to Thursday. (Well, maybe only for one week, but still, totally disappointed I couldn’t pick up some fresh calabacitas and jicama). One of the more welcoming changes was noticing the lack of dinghy dock fee enforcement. Sometimes the guard is there to collect your daily 20 pesos, but more recently, there hasn’t been any sign of the guards. Perhaps it’s not worth it to the marina to pay a man to sit there all day for so few dinghies. Of course, if they see you, they will run (and I mean RUN) down the dock to collect. Even if you’ve been there all day and are in the process of starting your motor to leave. I’m tempted to ignore the guard and just motor away, but with so few dinghies coming in, they’d probably figure out who we are and invoke some sort of fine. 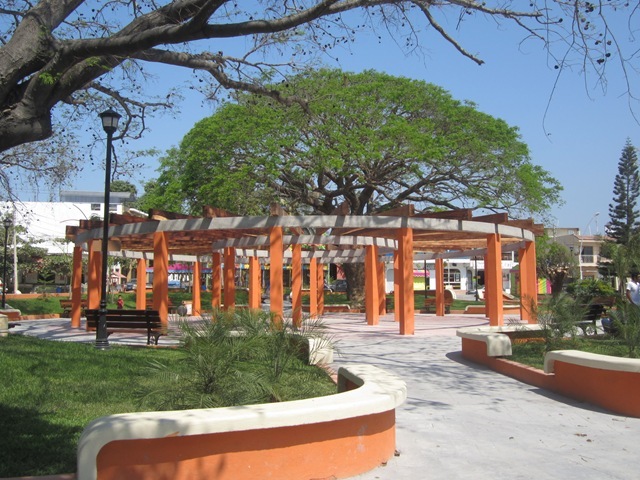 The town plaza renovations were completed during our absence and there’s a celebration going on in La Cruz this week with all activities surrounding the beautiful space. It was a pile of dirt when we got here in January. You couldn’t walk through, the streets were a mess with construction, piles of dirt and torn out concrete at every corner…it’s a colorful, peaceful site now. 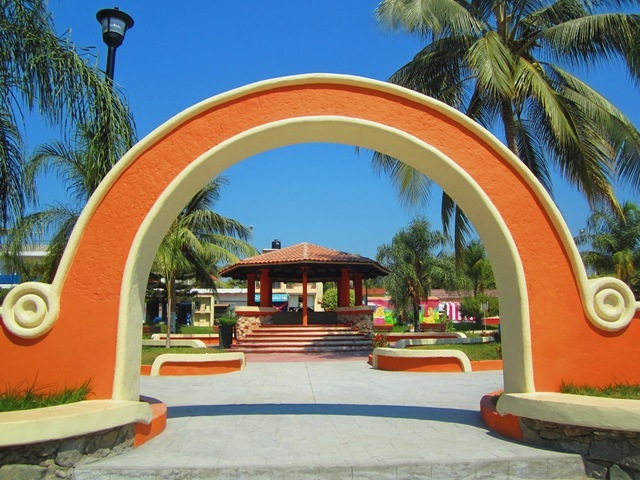 The completed La Cruz town square. Along with the plaza is the arrival of a small Kiosko (like a 7Eleven in the states) on Langosta Street leading up to the highway. While we were super happy to find out that we could recharge our TelCel account there instead of walking all the way up to the OXXO store (another 7Eleven type store), I’m a bit sadden that the sale of drinks and snacks there will push out the lovely mom and pop tiendas in town. The main one on Delfin Street that has the twice weekly produce market will probably be fine, but what about the one just up the street from the new Kiosko or the one on the next street over (Marlin St.) across from Tacos de Lena? I don’t believe I’ll ever sail back down to Bandares Bay after I head back to the States, but I do hope I’ll be back to La Cruz one day. It’s proven to me to be a much better place to visit than Puerto Vallarta, so I don’t think I could ever come back and stay at a big resort knowing that a quaint little town is just around the corner. I just wonder what it will look like a year from now. Two years. Ten years from now. I hope that La Cruz can hang onto what makes it so special to me – it’s small town, cruiser friendly atmosphere. 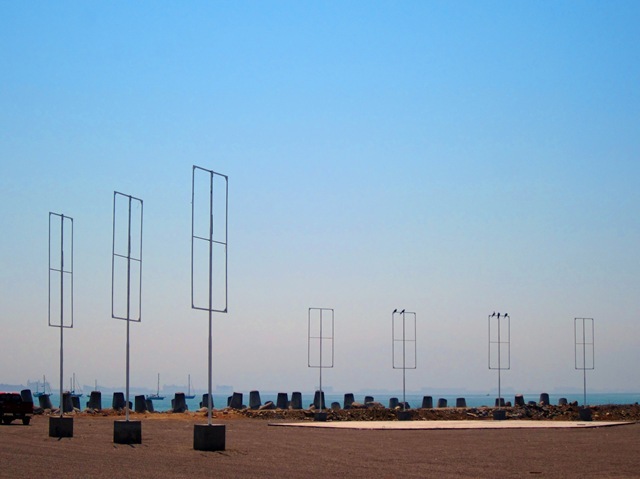 The marina is in the process of building…something. It’s hard to tell. At first I just thought they were paving the dirt lot next to the marina office for a parking lot – but after an initial paving of some spots, and erecting structures for banners and signs, I’m unsure what they’re planning next. I think it would be a shame to build up a huge complex and lose the amazing view of the bay. 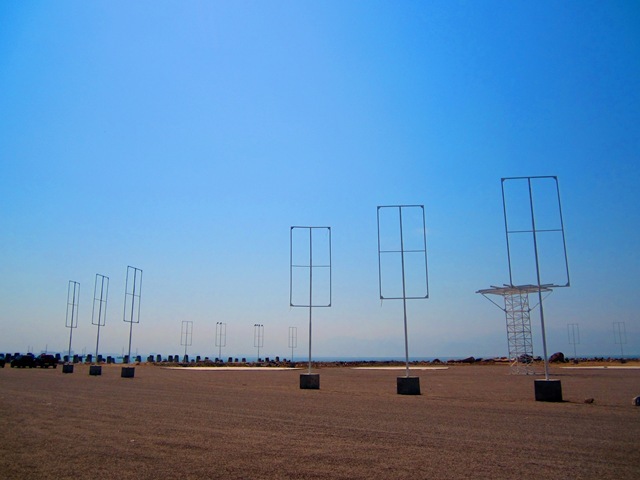 Banner holders, concrete foundation pads…what are they building at Marina la Cruz? The face of La Cruz is definitely changing. People thinking about cruising down here, should hurry up. This story has been sitting in the back burner of my mind for about three weeks. 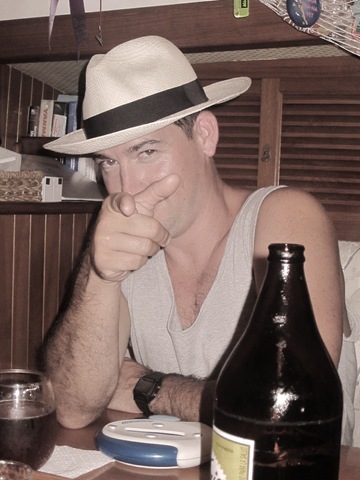 Not sure why I keep failing to tell it here because I’ve already told it to all our friends here in La Cruz. (And if Convivia is reading this – HOPE YOU DON’T MIND ME SHARING). So, Dave and I were working on boat projects one day (like every day). Dave was outside on deck and I was down below figuring out how to make the sewing machine work in my favor. I look out the hatch and sure enough, the cute kids from s/v Convivia are in their dinghy, but the dinghy is getting farther and farther away from Convivia. This doesn’t seem right to me. While their dad had recently told me he showed Ruby (7…and a half. Can’t forget the half) how to start the dinghy motor, I was pretty sure that since neither parent was on deck supervising this dinghy adventure that perhaps they weren’t supposed to have left the boat. Plus Ruby was trying to start the outboard while it was already in gear – so they’d float while she pulled and pulled on the cord and then it would eventually kickstart and send Ruby and Miles (4) flying back into the stern. Have you seen these escapees? They’re armed and very cute. I ran back downstairs and called for Convivia on the radio. No answer and by this time the kids had floated/half-motored their way over near our boat. I ran back up on deck and waved them down and invited them on board for a game of Uno. Of course, this was just a ploy to get them safely tied to us and out of the water. So I got the kids into their lifejackets and put them into their dinghy. I got in, and like I do with our own dinghy, cast off so we could start the motor without hitting any of our lines (we have a flopper-stopper line that could definitely foul up someone’s engine). But, since they have a different motor than I’m used to and Ruby wasn’t able to get it started either, I soon realized we had floated quite a bit away from Camanoe and in the opposite direction of Convivia. They have oars on their dinghy, so I just started rowing. But unlike Camanoe’s dinghy, their oars aren’t really made for rowing in the strong current that had picked up that afternoon. The only good part about the oars and my rowing was that at least we were treading water. Thus, NOT ending up on the rocks on the beach. At that point both Dave and Tucker from Convivia had noticed our little problem. Tucker couldn’t do anything but watch, but Dave jumped into our dinghy and started heading towards us. Dave got their motor started and soon we were flying over towards Convivia. Unfortunately, Ruby cut the engine a little too soon, so there I was again, with two small children, desperately trying to row them to safety while all their parents could do was watch. 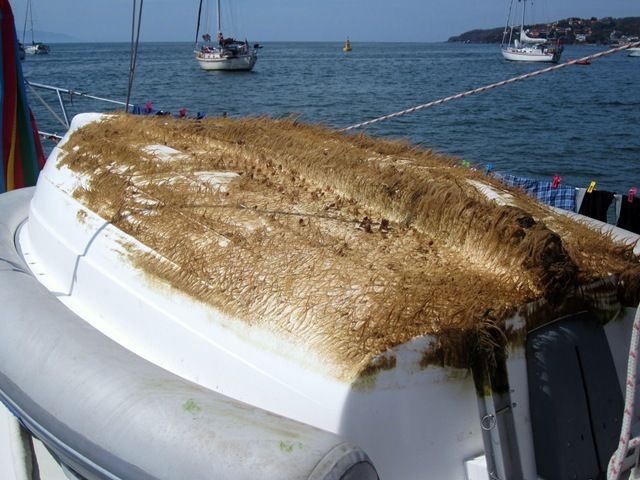 Eventually we made it close enough to Convivia that we were able to toss them a line and secure the dinghy. We headed downstairs where I got the royal treatment…literally. Ruby and I played dress-up where I was the queen, complete with tiara, and she was a princess. Miles kept wanting to show me his Legos and other toys. All three of us sat down to color and before I left I got to read them some stories in hopes of getting Miles to take a nap/have some quiet time. It was a really nice day not spent in front of the sewing machine and I’m so glad I didn’t lose their children to the sea. 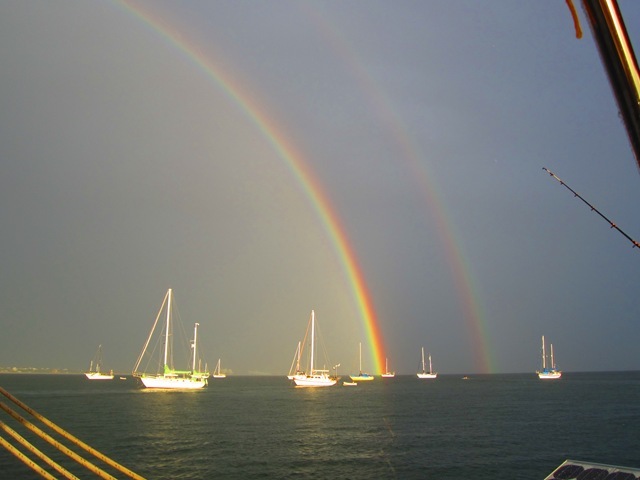 We found this little gem through friends on s/v Bella Star and s/v Ventured. Best. Recommendation. Ever. 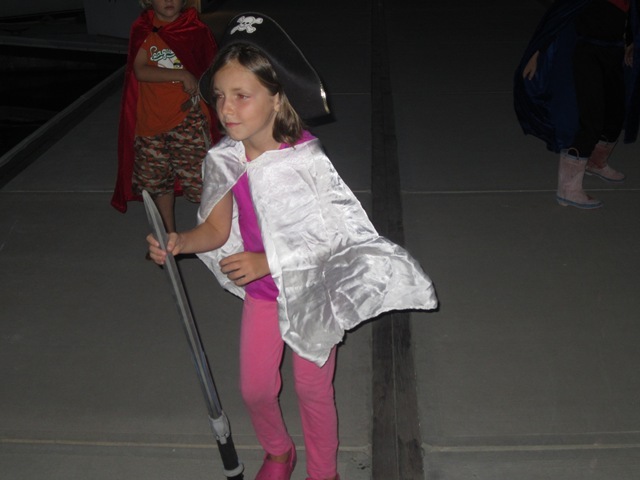 “Tacos de Lena” – AKA – Tacos in the Backyard – with s/vs Bella Star, Ventured and Jace last month. They serve tacos for 10 pesos. 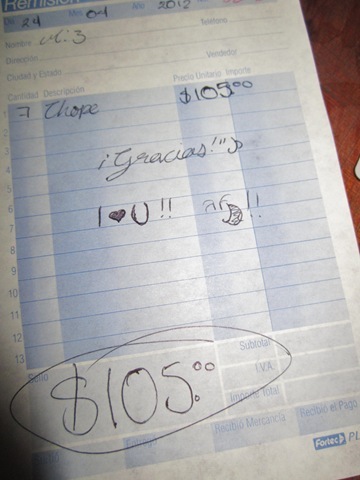 That’s less than a $1 USD per taco. We each have four to five tacos, plus GRANDE beers for under $10 USD total for the two of us. Best. Place. Ever. We’ve been there often; at least a couple times a week since we got to La Cruz. We’ve made friends with owner Pedro. His daughter recognizes me when we see each other out and about in La Cruz. Small town. Gotta love it. 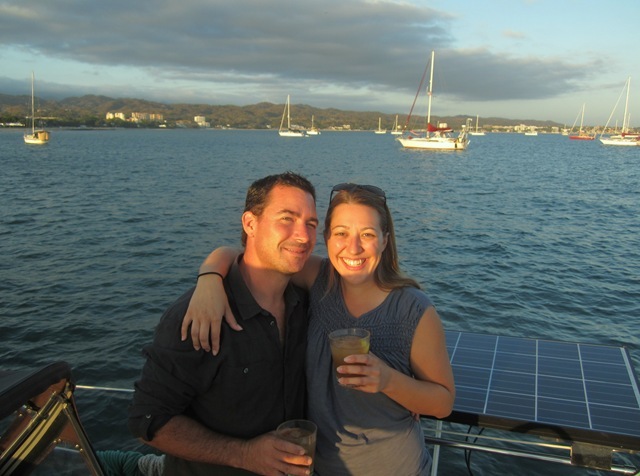 So we took s/v Navigo there for our last dinner out in La Cruz since they hadn’t been there yet. It was everything we promised them and more. The tacos were the usual yummy, cheapo goodness. 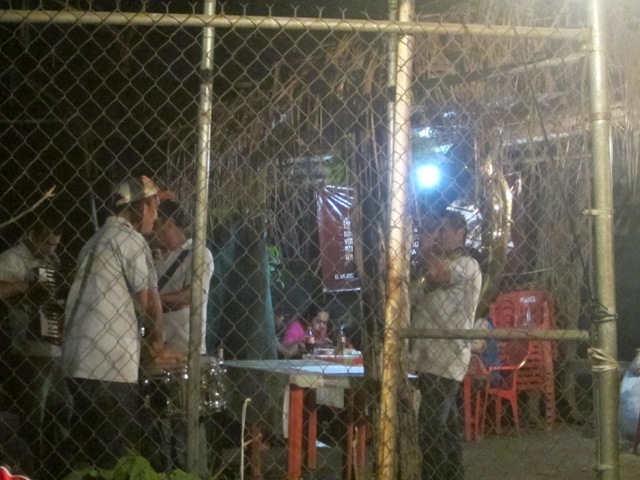 We were enjoying the evening when all of a sudden a van showed up outside the backyard fence and locals with various instruments started piling out. “Che es esto? ?”, we asked Pedro. He said something in Spanish, but we couldn’t figure out what his reply was. 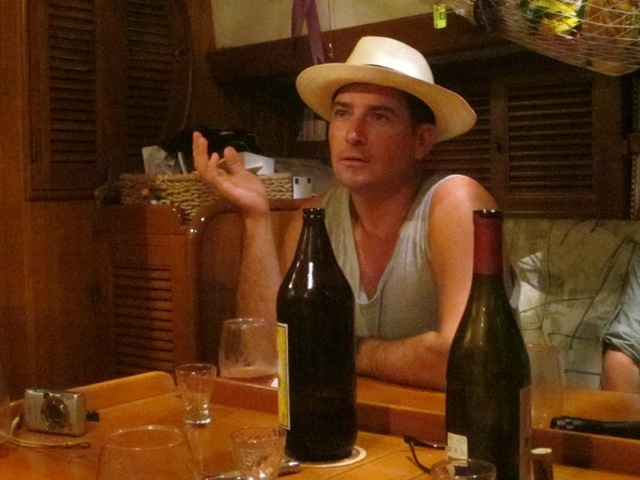 The cerveza he was sipping might have had something to do with the translation problem. Anyway, drums, a guitar, an accordion and a tuba start to jam in the backyard. 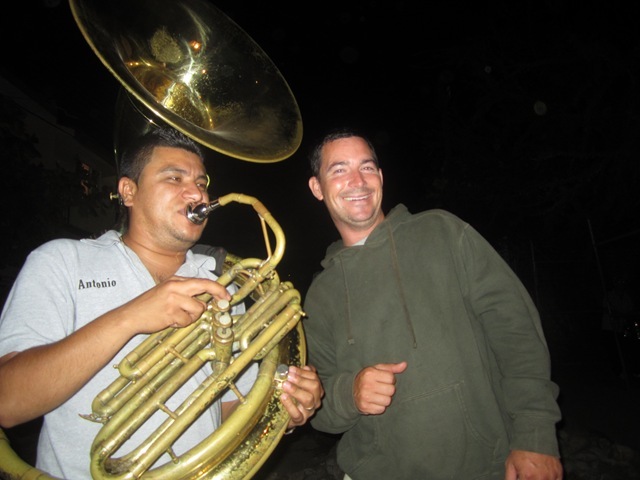 Pedro sees how much we’re enjoying the music and tells the tuba player to go out to our table and serenade us. 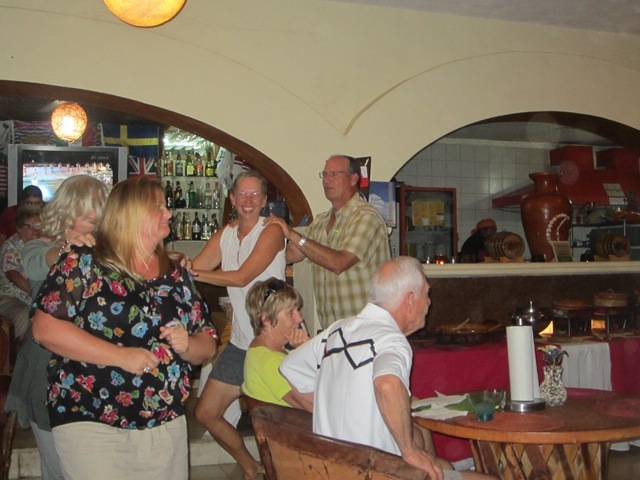 Soon there’s dancing and then the locals also eating there invite us gringos to dance with them. I tell Camelia I’ll go if she goes. We march right up to the band and then they make us dance in the middle of their circle. Um….we didn’t want to be the center of attention. But it’s all in good fun. I asked her…”Venti Uno?” She looked about 25, but thought I’d play it safe and ask her if she was 21. Thank God I did! She was turning 22. Oops. We tell Pedro goodbye, promising we’ll return in “un mes” (one month). I’m not sure we’ll ever be able to find a better taco place. 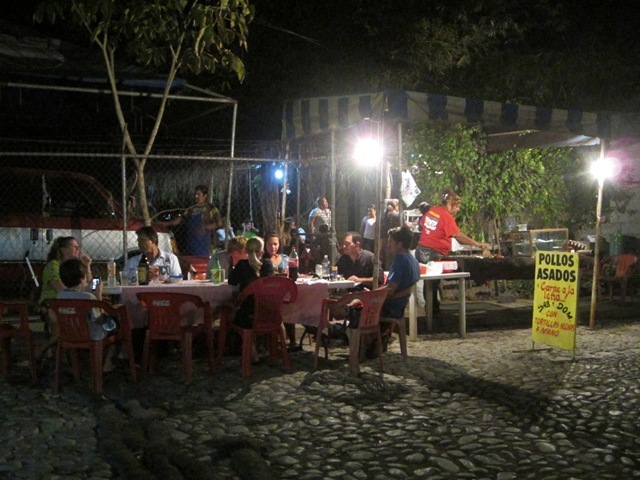 We’ll be leaving for Yelapa and towns south soon, so we figured that night was a great way to end our time in La Cruz. As we prepare to weigh anchor and head south towards Barra de Navidad, here are a couple more La Cruz moments that we won’t be forgetting any time soon. While we do LOVE La Cruz, there was a bit of drama a couple of weeks ago when the marina here decided to impose a dinghy dock fee to those of us anchored out. This isn’t a horrible thing; we’ve been to numerous marinas along the coast and baja and while most have been free, the occasional, and very nominal fee does pop up. Nominal meaning somewhere between 10 and 30 pesos. After much complaining and then gathering together as a group and talking with the marina owner and manager, both sides agreed to 20 pesos for a 24-hr period (including garbage drop-off). Everyone listened to each sides’ concerns and reasoning and things seem to have settled down. In hindsight, Dave and I are unhappy with the way the marina treated the cruisers. We don’t have a problem with a fee being imposed. A FAIR fee. But the way the whole thing was handled was really shady and made us feel very unwelcome. 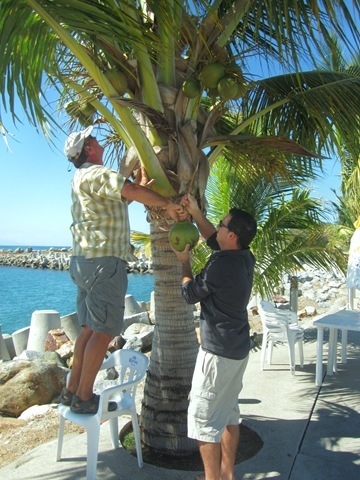 We had considered going into the La Cruz marina for a couple of days to stock up and power up the boat, but we really don’t need to, and if we do, there are a couple of other marinas in the area that we’d rather patron first. This hasn’t changed our opinion of La Cruz or the wonderful locals we’ve met and we’re glad that the marina’s politics haven’t affected the economy of this small town, which is what surely would have happened had the $5 fee stood. 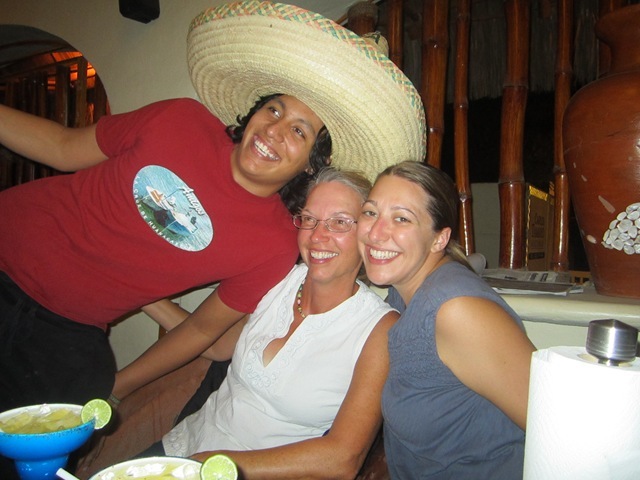 OK, so onto happier memories…With other cruiser friends in town, every night can turn into a great party. And as a cruiser…pretty much everyone is your friend. 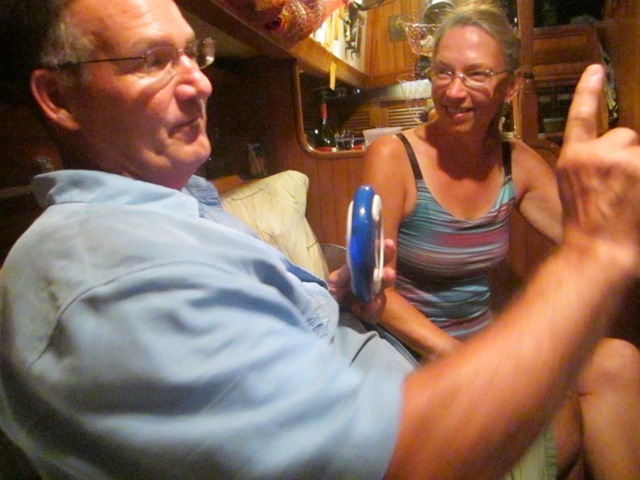 Bob and Camelia on s/v Navigo sailed back into La Cruz a couple weeks ago. We hadn’t seen them in over a month and we were so happy to get to spend a little time catching up with them. One of their first nights in town I joined them at Ana Banana’s – a restaurant in La Cruz that Dave and I had somehow skipped our first month in town. They always have live music and there have been rumors of free tequila shots. So I tried it out with Navigo on a Monday night when the band Pacific Rock Company was playing. This band was awesome. Someone told us the band has been playing there every Monday night for eight years. Not sure how this is possible when the guitar player looks like he’s 15….but it doesn’t matter, because they rocked it. We danced and sang along until midnight. Pacific Rock Company before the crowd hit the dance floor. Three guys; awesome tunes. Dave and I checked out Ana’s later in the week just for dinner because it really is quite nice on their patio under all the trees. Too bad the trees started attacking us. We’re sitting there enjoying the evening and our dinners when all of a sudden I feel something fall onto my forehead. I quickly brush it away, but I accidentally brush it INTO my food. Lo and behold, a small, but fast, centipede. He quickly crawls to safety under my french fries. I shriek. I practically brush all the french fries to the floor trying to get the little buggar off my plate, all the while, people at adjoining tables are looking. I smile; situation now under control and everyone returns to their conversations. Not even a minute later and something falls from the trees onto our table right beside both our plates. I shriek again. A small piece of fruit or nut from the tree above has crashed onto the table and then rolled onto the floor. I still like Ana’s, but every time we go now, I pick a spot clear of the trees. Now I’m just waiting for a bird to come crap on us. With tequila shots on the line for the losers of each round, things were definitely tense onboard s/v Charisma the other night. 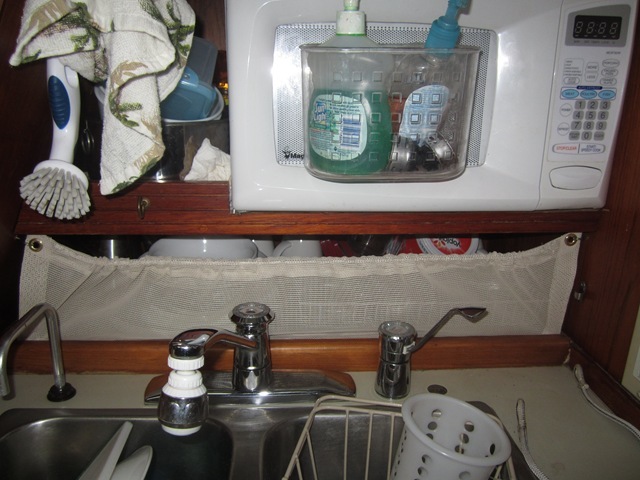 As you can tell from the photos…. J/K guys…you were good sports…especially when Ann was dealing out your medicine. As I mentioned in my long post about being long-term cruisers in La Cruz, we love it here, and yet, at the end of the day, I don’t feel like there’s anything that I NEED to blog about. It’s all enjoyable and when I think back on all our taco outings and late nights at Huanacaxtle Bar and various amusing happenings around town, it makes me realize that I SHOULD be posting these random thoughts. If not for your entertainment, at least for my own benefit when I’m back to normal life and want to remember our wonderful time here. In no particular order…here are some of our most fun times. Every Thursday night is live music followed by karaoke at our favorite local spot, Huanacaxtle Bar and Cafe. 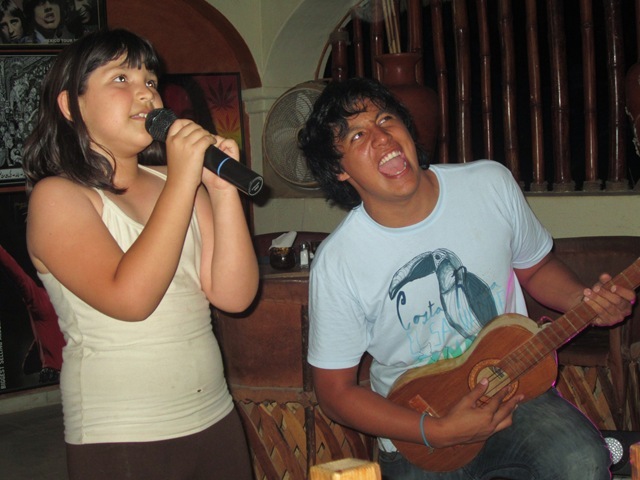 We’ve gone a couple of times while here in La Cruz but for some reason, two weeks ago (also s/v Charisma’s first night in town) they announced that the karaoke would be a contest with some sort of prize at the end (I never figured out what the prize actually was). 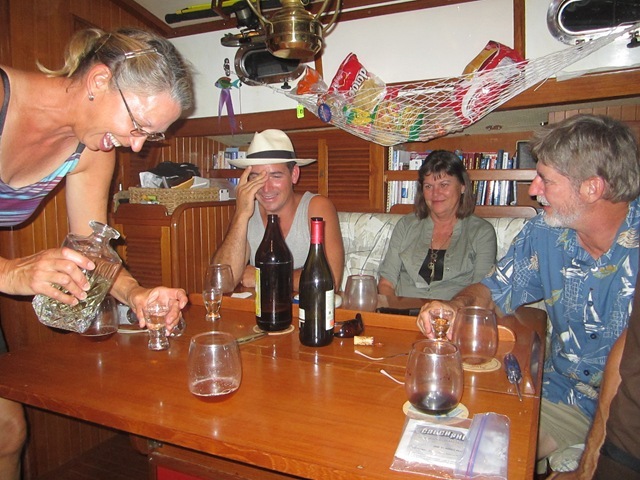 We were with s/v Charisma as well as s/v Journey and had a great time singing and laughing and of course, drinking their cheap draft beer. Tami from s/v Journey and I were chosen as two out of the dozen finalists (basically, anyone that sang became a finalist). In order to chose the winner they had all the finalists sing “Bohemian Rhapsody” together while the karaoke host stuck a mic in our faces throughout the song. It was both ridiculous and very fun. Neither Tami nor I won the contest, but we had a good time anyway. Huanacaxtle also has a weekly all you can eat buffet on Saturdays with live, local music. We hadn’t planned to drop in, but after some cocktails aboard Charisma and dinghying to shore, I had to use the bano and Huanacaxtle was very convenient. I stopped in and when I left the bathroom our clan had already decided that the buffet and music was a better option than the taco place we had originally set out for. What a night. 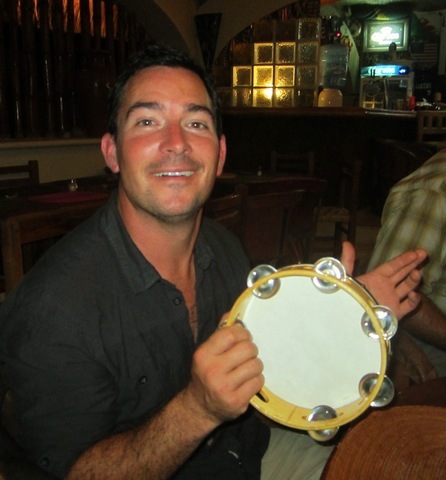 Live music turned into dancing, turned into a conga line, turned into a “play along with the band with these random percussion instruments.” The two margaritas per person included with our buffet dinner didn’t have anything to do with the fun at all. 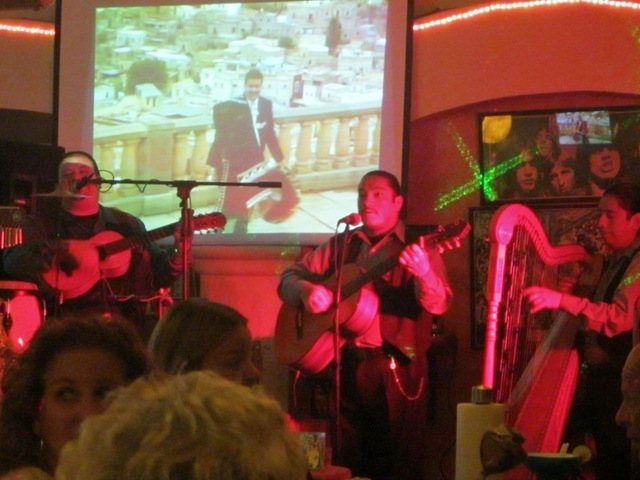 (Top to bottom) The band at Huanacaxtle Bar…yes, that’s a harp; Dave shaking it; Conga dancing with Charisma bringing up the tail end; Oliver from Huanacaxtle with another round of margaritas for Ann and me. These pictures just say everything. Being good Catholics, Ann from s/v Charisma and I went to the La Cruz church last Wednesday to get our ashes. We had been told that there would be masses at 8am and 8pm or you can just go to an ash service either at 9am, 10am, 11am, 12pm or 3pm. We got to the noon service about 5 minutes late and noticed that there were only a handful of people in the pews and all of them already had ashes on their foreheads. Did we miss the whole service??? That didn’t seem right, so we just sat in the pews for a couple minutes to see if maybe the last service had gone long and the next one just hadn’t started yet. 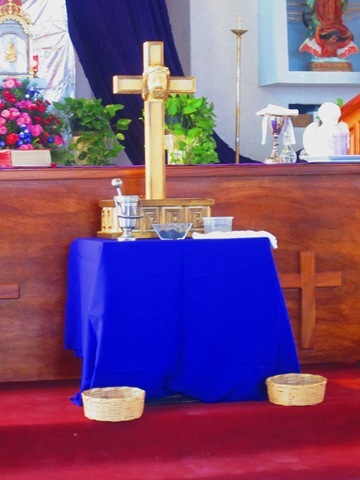 Then a mother and her two small children came in the church and went straight up to the alter, bowed and then proceeded to administer their own ashes. You ash yourself?!?! Ok, we thought. So Ann and I got up, blessed each other with the typical “Remember you are dust and from dust you shall return,” and applied the ashes. Quickest Ash Wednesday service I’ve ever been to. 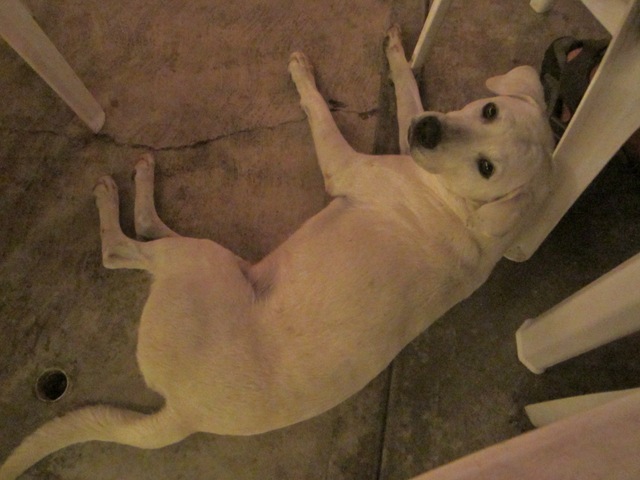 There’s a sweet dog that roams the streets near the Huanacaxtle and Ana Banana bars. 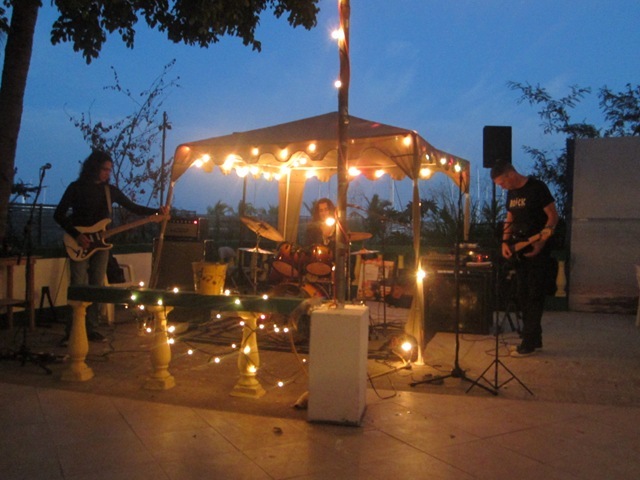 Last night we stopped at Ana’s for a couple beers and to listen to the rockin’ band. Lo and behold here comes the cute dog. He followed us back to the dinghy dock that night and we sadly left him behind. Dave and I want a dog. 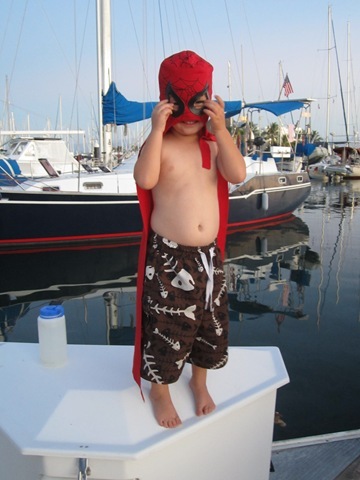 If this one keeps coming around, we may just have to persuade him into the dinghy and up into Camanoe (although this could prove difficult since he doesn’t respond to any commands whether in English or Spanish). We don’t know if he already has a name, but we’ve nicknamed him Hecho. What’s “hecho” you ask? 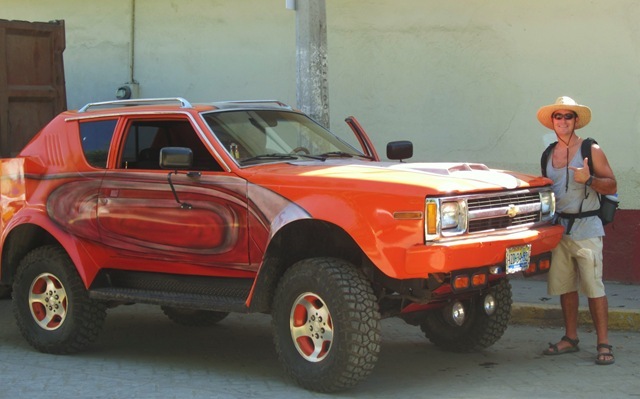 It means “made.” As in, he’s made in Mexico. Siéntese Hecho. Siéntese. Buen Perro. I’ve got a couple more of these random stories…more to come. 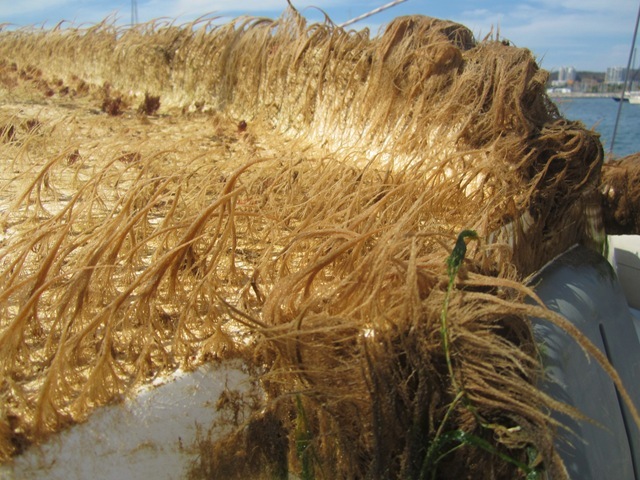 It’s the underside of our dinghy. 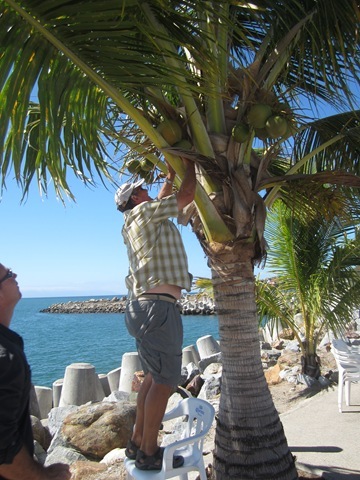 Some people get to the port of La Paz on the Baja side of Mexico and never leave, coining the term, “La Paused.” Well, we’ve been in La Cruz de Huanacaxtle (pronounced wanna-cox-lei) for over three weeks and we really have no plan as to when we’ve leaving. Thus, I’ve decided that we’re now in “La Cruz de WannaStayForever.” I’m up for other name suggestions along this same idea. Anyway, I haven’t been writing much because, although we’re loving this area, I can’t say that when we finish up a day that I have anything EXCITING to share. 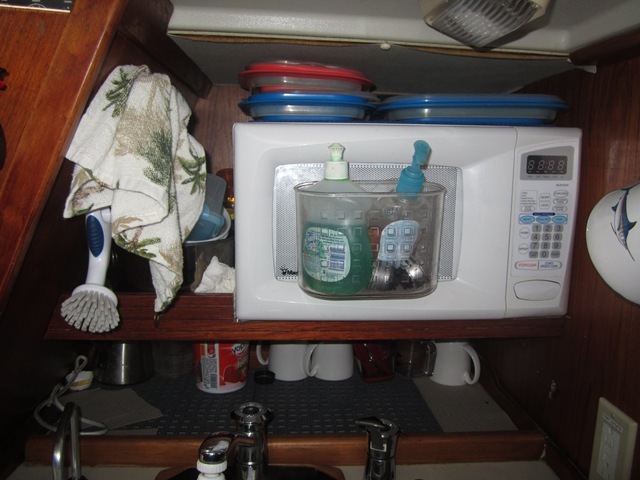 We get up, Dave starts a project while I either go ashore for provisions or work on my own small projects, then by early evening we’re cleaning up the boat and ourselves and either making dinner or going ashore for cheapo tacos. We go to bed and start all over again. The little town of La Cruz is very sleepy. Not much opens prior to 10am, except for the Mercado del Mar where we’ve bought freshly caught shrimp a couple of times. Most of the taco joints don’t appear until 7pm or later. And when I say, “appear,” that’s exactly what I mean. All of a sudden, people appear with grills and they’re dragging out plastic tables and chairs and they serve THE BEST, cheapest tacos you can imagine. A lot of the time during the day, I just roam around and meet up with other cruisers. I’m in no hurry to be anywhere or to return anywhere and that’s a nice feeling. 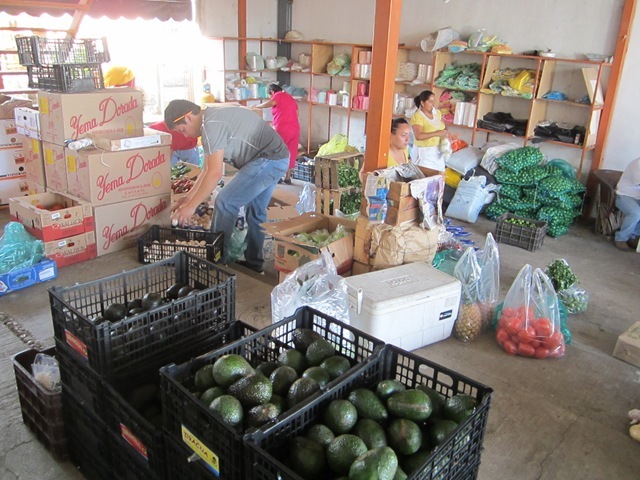 The produce market is every Tuesday and Friday at 5pm; there’s usually a cruisers’ swap meet on Saturday mornings and there’s a large artisan/farmer’s market every Sunday from 10am-2pm. Otherwise, you just sort of hang around La Cruz and wait for something to happen or someone to invite you to go do something. 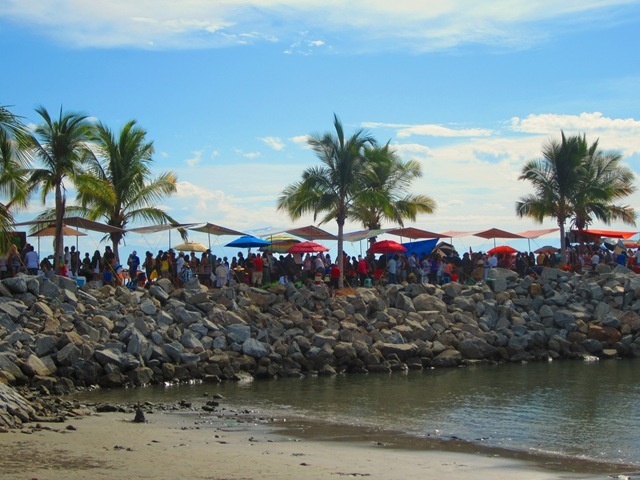 Tuesday produce market (L) and the Sunday morning market along the Malecon (R) in La Cruz. 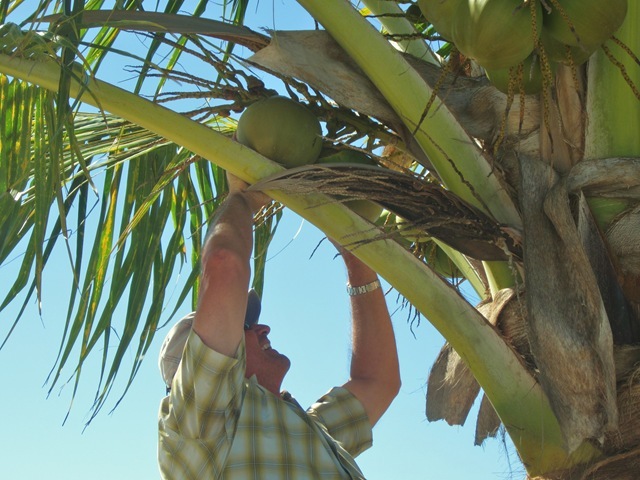 I’ve travelled into nearby towns, Bucerias, Sayulita and Nuevo Vallarta. 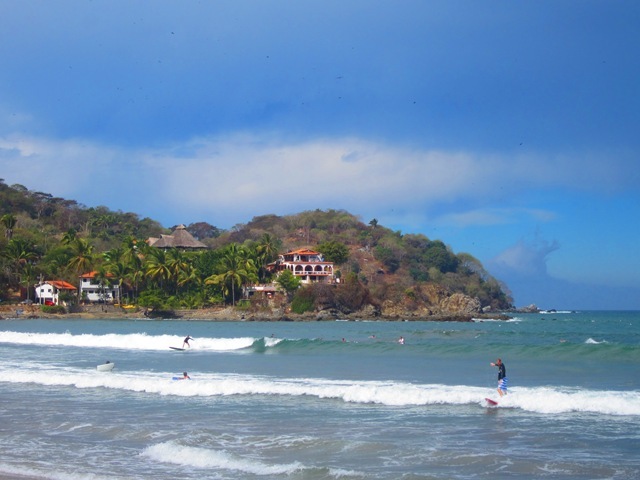 While Nuevo is very much a smaller version of Puerto Vallarta, mainly a resort town, Bucerias and Sayulita are small beach towns that are frequented by locals and tourists alike just looking for a little sun and surf. 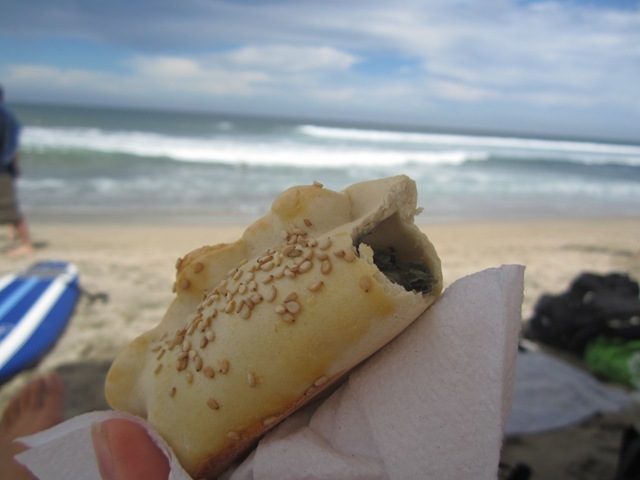 Enjoying a beach and surf day at Sayulita with a warm empanada. Dave’s been working on various boat projects he wants done before he jumps to Hawaii in a couple months. 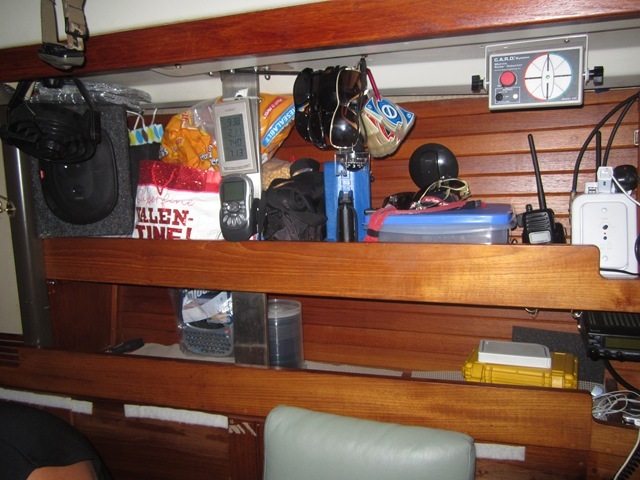 He has a sea anchor and a sea drogue for dire emergencies and he’s glassed-in, bolted, and basically secured all items necessary to deploy either one should he get into a bad storm. We’ve hooked up a trolling generator (which I made a canvas cover for), which required Dave to make a step on top of the wind vane platform in order to attach the generator. He’s reinforced our stanchions and glassed them in to keep them from leaking. He figured out why the propane locker was letting in water whenever it rained or we had the hose on and then proceeded to fix that. I’m sure I’m forgetting something else that he’s worked on and I can’t even begin to explain EXACTLY what all those projects were and how they help, but just know that while I’ve been soaking up the La Cruz atmosphere, Dave’s been a slave to Camanoe. I’ve helped out where I can, mostly with the sewing machine. We have a lot of open shelves in the salon and galley, so my job has been to sew lee cloths/curtains for all these open areas. 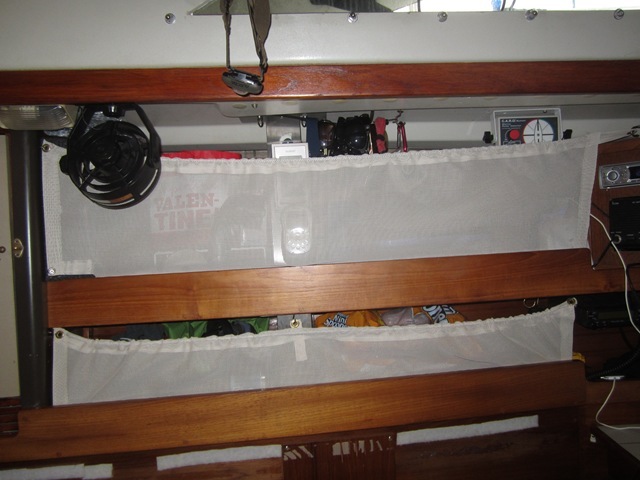 There was also the trolling generator cover to protect it from sun and moisture and I also created a sleeve for our two hatch covers so they can be stored nicely without banging into each other or scratching up the boat. Pre and post lee cloth shelves in the salon (top photos) and galley (bottom photos). Yes, I realize how little time my projects took compared to Dave’s. 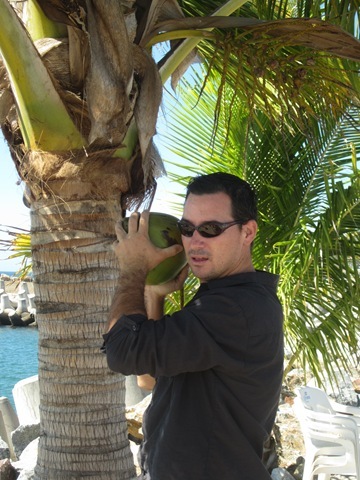 So, what’s next after the projects are complete (or at least, complete enough for Dave to sail to Hawaii)? Well, I’m hoping to head a little farther south to Barra de Navidad and possibly Manzanillo before heading home to the Bay Area. There’s no exact date set yet for Dave to begin his crossing, so when we figure that out, I’ll have to get a plane ticket. But, in the meantime, La Cruz is a nice place to play and relax and work on boat projects. The anchorage is full of friends, the town is sweet, and we have everything here that we need. 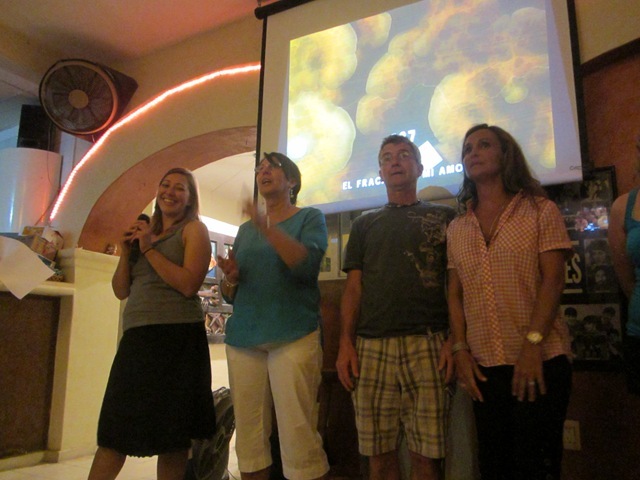 Yes, I need to update the blog on San Blas, Chacala, Jaltemba and now La Cruz, but we had fun last night (our first night in La Cruz) catching up with cruising friends and I thought I’d share a little video. Singers include Nicole and Aaron from s/v BellaStar, Jenn from s/v Ventured, and Ben and Mickey (lead singer) from s/v Chase. Awesome. I liked the “whoo-ing” the best. I’m sure the natives in attendance got a big kick out of the gingos.